At a meagre 357 square kilometres, there is no denying that Nkasa Rupara is a small national park; however, it lies in the midst of a vast wildlife-rich region: a watery wilderness of tree-covered islands and expansive wetlands that ensures prolific birdlife and spectacular game-viewing. This park seldom sees more than 200 tourists a year, so it is properly wild and that is what I love most about the place. A powerful wilderness vibe is not, however, the only reason to visit. Wildlife is also plentiful and so are the big cats. Most nights I’ve slept here, I’ve been lulled to sleep by the guttural roaring of the parks chief terrestrial predator. Leopard, cheetah and wild dog also occur, along with huge herds of buffalo and elephant. This paradise, largely unknown and undiscovered by tourists, is one of Southern Africa’s last true wilderness areas. Nkasa Rupara lacks infrastructure and much of the reserve is flooded wetland, so is not for the faint-hearted; but, it certainly is for adventurous souls who love the solitude of a genuine wilderness experience accompanied by top sightings. Like Mudumu National Park, Nkasa Rupara lies in East Caprivi, with the beautiful Kwando River marking its western border. As the river approaches the park’s southernmost point, it spreads into channels, takes a left turn and becomes the Linyanti River, which later becomes the Chobe before flowing into the Zambezi. As you’d expect, the best thing about Nkasa Rupara is the river and its channels, islands and floodplains. Fans often describe it as Namibia’s answer to the Okavango Delta. I think that’s stretching the truth, but it’s certainly a great place to explore a pristine river environment and watch birds or rare, water-loving animal species such as sitatungas and red lechwes along with elephants, buffalo and noisy pods of hippos. There are also wild dogs here, but you’d have to be extremely lucky to see them. Nkasa Rupara has no campsites and practically no infrastructure. Getting here isn’t easy, but if you’re travelling by 4WD or are staying on the Botswana side of the river you may be able arrange a visit. Nkasa Rupara is just across the Kwando River from Botswana, and its ecology of flat floodplains, swamps and seasonal channels reminds me a lot of the Okavango Delta further south; and so it should as its part of the same vast river system. But there’s none of the development and no facilities. On our visit a four-wheel-drive was essential, we were the only people in the park, and the ‘entrance gate’ was a long bridge built of fragile looking mopane branches that we crossed from Mudumu. Except for a reasonably large herd of buffalo and some giraffe in the woodlands, we didn’t see much wildlife; after the rains there tends to be more, but that’s when most of the tracks are likely to be impassable. However like neighbouring Mudumu, antelope that favour this swampland environment are present; red lechwe, sitatunga and waterbuck. There’s something about Nkasa Rupara (Mamili NP) that sets it apart from the other Zambezi Region parks. For a start, it lies well south of the region’s major population centres, removing it nicely from the clamour further north. It’s also just across the water from the wildlife-prolific Linyanti region of northern Botswana and a boat trip here can yield some fine sightings into Botswana where wild dogs and other Linyanti specialties are present. On both sides, the birding is fantastic, and elephant, lion and leopard are all possible. In the park’s northern reaches, too, you’ll find a handful of excellent accommodation options, from tented camps to self-drive camping areas. If you can choose any two parks to visit in the Zambezi Region, Nkasa Rupara has to be up there with Bwabwata. 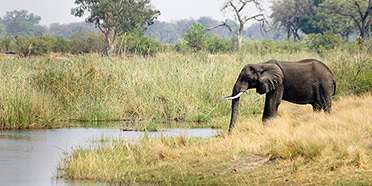 Nkasa Rupara National Park is found deep in the Zambezi Region, and is characterized by its floodplains, intricate river channels and riverine islands. It’s not the easiest place to get to, but worth the effort if you’ve got time to really get to know this region, and especially if you want to experience some of Namibia’s best and most secluded eco lodges and camps, including Nkasa Lupala Tented Lodge and Jackalberry Camp, which is built into a giant jackalberry tree. I didn’t see a lot of big game here, with elephants the most notable absentee considering their prevalence in the wider region. Having said that, there were lots of lechwe, sitatunga and other antelope species around, not to mention a veritable carnival of birdlife. Like so many other parts of the Zambezi Region, for me a large part of the appeal of Nkasa Rupara is the distinct lack of tourists compared to the likes of Chobe just across the border into Botswana.